Praxedes “Prax” Serrano has lived on Long Beach Island for about fourteen years. Originally from the small town of Oaxaca, Mexico, he graduated from Martin Luther King Jr. High School and attended two years at Cooper Union School of the Arts in New York City. His passion for nature started while growing up on a farm in Mexico amongst the mountains, forests and a river where he would catch wild shrimp. Now living in Ship Bottom, NJ, he wanted to do some paintings of places around the Island. “I keep learning techniques as I go along. I like bright colors; sometimes if I don’t get the color I’m looking for I go over and over until I get it right. I like to be creative,” said Prax. He focused on the beach and the bottom of the deep sea which for him is like another world to be discovered. 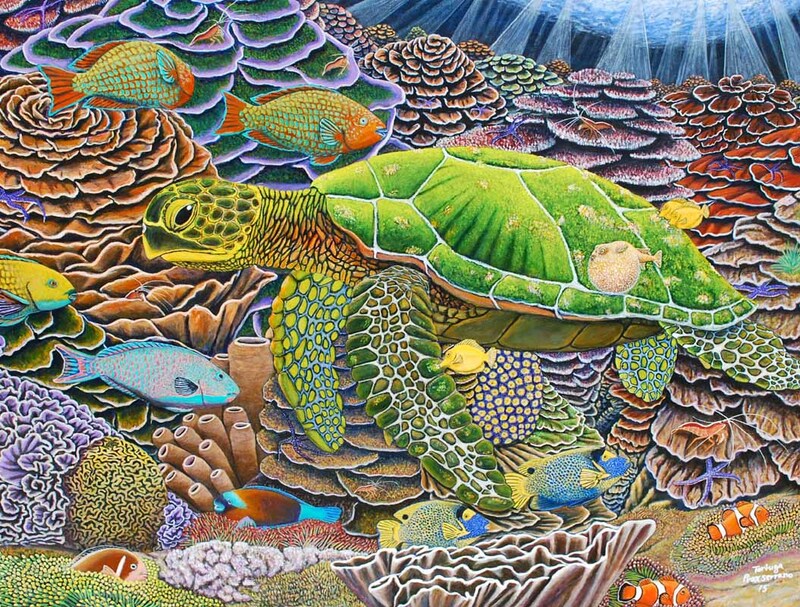 He paints on 36” x 48” canvases with acrylics to add as much detail is possible. He must work fast because the acrylic drys very quickly, yet it can take Prax four to eight months to complete one piece.